scans_daily | DAREDEVIL: GUARDIAN DEVIL - Matt gets angry. 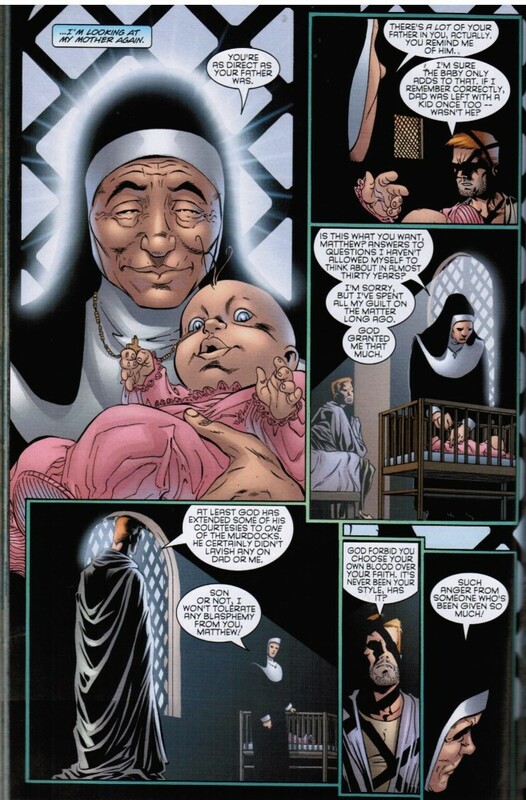 In BORN AGAIN, Matt Murdock found out two things: his mother, Maggie, was alive and a nun; and that his ex-girlfriend Karen Page sold his secret identity for a fix of heroin. And he wasn't angry about either of those things. And in GUARDIAN DEVIL, done about 15 years later, Matt Murdock finally voiced his anger about these things. Sort of. Interesting point: We never got the "Why" about Maggie leaving Jack and Matt until Mark Waid wrote the Daredevil tie-in issues to "Original Sin." And now we get to Karen. Harsh. Although Matt doesn't mention "You sold my secret identity for a fix" here. Maybe he really isn't angry about that. It annoys me that people regard this as a classic when if it weren’t for Karen’s death no one would remember it. I’ll give Smith credit for actually writing about Matt’s faith which everyone else after effectively ignored until Soules made him an atheist. Some things good but the whole crazy mess being by Mysterio was a bit much. Although I did get a kick out of his bit of posing as the doctor telling Karen she had HIV and letting her own lifestyle convince her. "Maybe she was, maybe she wasn't, you'd think she'd at least get a second opinion." I will still believe, til my dying day, that the whole 'Oh nevermind, it was all a Mysterio plot' was editor-mandated as opposed to Smith's actual plan. Because that resolution just rang false to me and came out of nowhere. Mysterio being behind all of it made sense to me, if for no reason other than it explains Matt's mood swings very well. Is Mysterio known for drugging people? That usually isn't his thing...OR IS HE? I find most of Smith's comic book work underwhelming. The writing flaws in The Evil That Men Do and The Widening Gyre didn't just materialize out of nowhere. 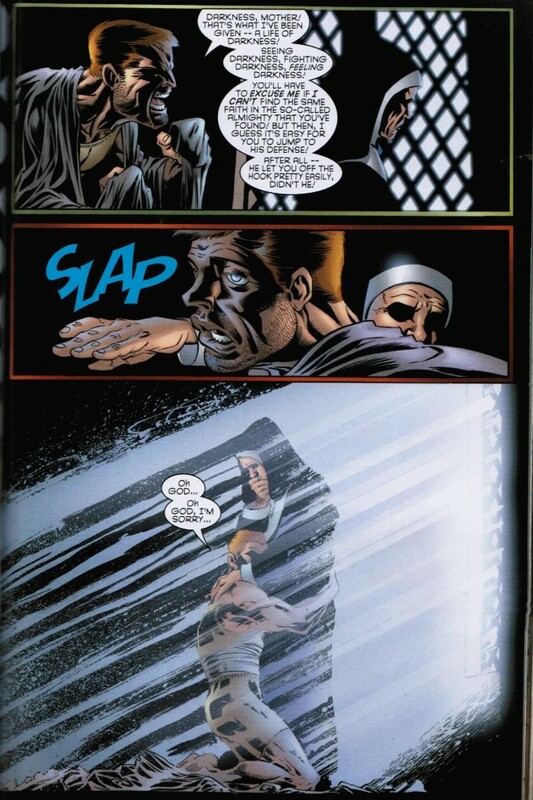 Matt's anger was, at the time, focused on Fisk, and he was pretty burned out on it by the time he got to those revelations. But he specifically forgave Karen for the secret identity sellout, and while Matt is a long way from perfect, he at least stuck to that one. What makes Matt angry here is Karen apparently refusing to take responsibility for her past, buying into the "evil baby made me do it" theory. He's sure not a saint here and that last thing he said to her will haunt him later, but the root of his frustration is a lot more understandable than it would've been if he'd gone back on his word. It is close. If Matt had said "Your carelessness may have destroyed my life ALL OVER AGAIN," we would know he meant the "secret identity selling." Karen probably realized the same thing.